I wrote about my bathroom last month. I can finally say that the project is finished. We did almost everything ourselves. The plumbing was performed by our neighbor. The lighting made it difficult to show, but the ceiling is white and the wall is light gray. I am placing this post in Darcy’s P52 challenge with the theme of sacrifice. Six people, one shower, one and half to two months. Really, who’s counting the length of sacrifice? A good two weeks was spent figuring out a way to make the niche with glass shelving. We used safety glass from a place up near my family’s homeplace. The goal was to have the shelves be aligned with the grout lines. It worked out very prettily (and was Mr. TellBlast‘s idea). 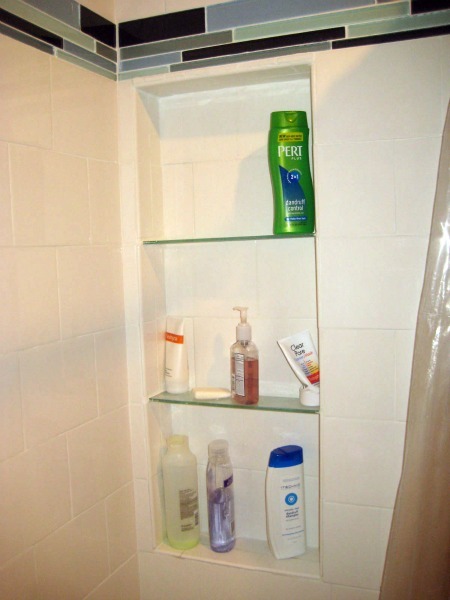 This entry was posted in etc., frugal family, photography and tagged bathroom remodel, p52. Bookmark the permalink. Love the built in shelving! Great job on the DIY!